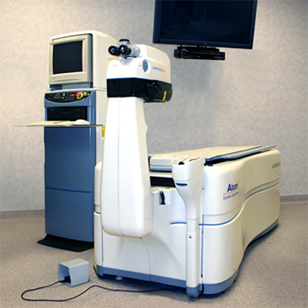 The Alcon LADARVision® autonomous excimer laser was acquired and installed at our practice in April 2001. It is a third-generation flying spot laser with the advantage of being approved to treat farsightedness and mixed astigmatism. This was also the first laser to gain FDA approval to begin performing custom wavefront ablations, making it the most advanced laser on the market. The laser is also equipped with one of the fastest and most sophisticated tracking system in the industry. Designed by former NASA space engineers, this tracker locks onto the patient’s eye using laser radar and follows any eye movements that might occur during the laser procedure. The laser radar tracking system was 6.7 times faster than any other tracker. This technology allowed the laser to correct higher-order aberrations by making custom LASIK procedures possible. As the only Utah vision practice to have performed extensive vision correction surgery with so many different all-laser LASIK technologies, Hoopes Vision in the greater Salt Lake City vicinity, is able to provide our patients the distinct advantage of hands-on experience to determine the best lasers on the market for vision correction. Hoopes Vision had stopped using the LadarVision laser some time ago in favor of results from newer lasers such as the Ziess MEL 80 and Allegretto EyeQ 400.